Friday, Sept. 7 — vs. Oakland (Cliff Keen Arena), 1 p.m.
vs. LSU (Cliff Keen Arena), 7 p.m.
Saturday, Sept. 8 — vs. Colorado State (Cliff Keen Arena), 7 p.m.
ANN ARBOR, Mich. — Following a sweep of Valparaiso to begin the week (Tuesday, Sept. 4), the University of Michigan volleyball team (6-0) will get back in action this weekend (Sept. 7-8) during the Michigan Challenge. The Wolverines will host Oakland (1 p.m.) and Louisiana State (7 p.m.) on Friday (Sept. 7) before wrapping up the weekend with a match against Colorado State on Saturday (Sept. 8) at 7 p.m. All three matches will be played inside Cliff Keen Arena. The Wolverines will enter the weekend with a perfect 6-0 record and a 4-0 record when playing inside Cliff Keen Arena this season. All six of Michigan’s wins to start the 2018 campaign have come by a 3-0 sweep, which ties a 1984 program record and marks the Wolverines’ first six-sweep start during the rally-scoring era. Following a perfect 3-0 sweep of the Michigan Invitational Tournament, the Wolverines jumped three spots in the AVCA Top-25 Coaches Poll this week and are ranked No. 20 with 310 votes. Michigan began the year as the second team out of the top 25 preseason poll with 153 votes, but entered the poll at No. 23 following a 2-0 showing at the War Eagle Invitational to kick off the season. Oakland will enter the weekend with a 3-3 record and on a two-match losing skid after winning three in a row. Looking to make their first NCAA Tournament appearance since 2014, the Golden Grizzlies are led offensively by sophomore middle blocker Jamie Walling, who is averaging 2.48 kills per set at a .389 attack average along with a team-leading 1.24 blocks per set. LSU owns a 2-4 record coming into the weekend after dropping matches to Duke and South Florida at the Tiger Classic last weekend. Despite a tough schedule, sophomore outside hitter Taylor Bannister ranks fourth in the SEC with a team-leading 4.27 kills per set, while junior middle blocker Jacqui Armer‘s 1.09 blocks per set ranks sixth in the conference. The Rams will go into the weekend with a 4-2 record following a 2-1 showing at home last weekend. Despite beating Florida State and TCU last week, Colorado State dropped out of the AVCA Poll after losing its weekend opener to Cincinnati and is now the eighth team outside the poll with 21 votes. Redshirt sophomore Breana Runnels leads the Rams’ offense with 3.81 kills per set, while redshirt junior Kirstie Hillyer’s .357 hitting percentage ranks in the top 10 in the Mountain West Conference. In addition to freshman Paige Jones, who made her debut in the Wolverines’ season opener against High Point, the Maize and Blue has had four more players make their Michigan debuts in the past week. Freshman Kayla Bair made her collegiate debut last weekend in a win over Cleveland State (Aug. 31), while freshman Abbey Malinowski made her first collegiate appearance in a victory over Eastern Michigan (Sept. 1). Transfer-junior Katarina Glavinic also appeared for the first time in a Michigan uniform against EMU (Sept.), and freshman Lizzie Sadilek first appeared earlier this week in the Wolverines’ sweep of Valparaiso (Sept. 4). 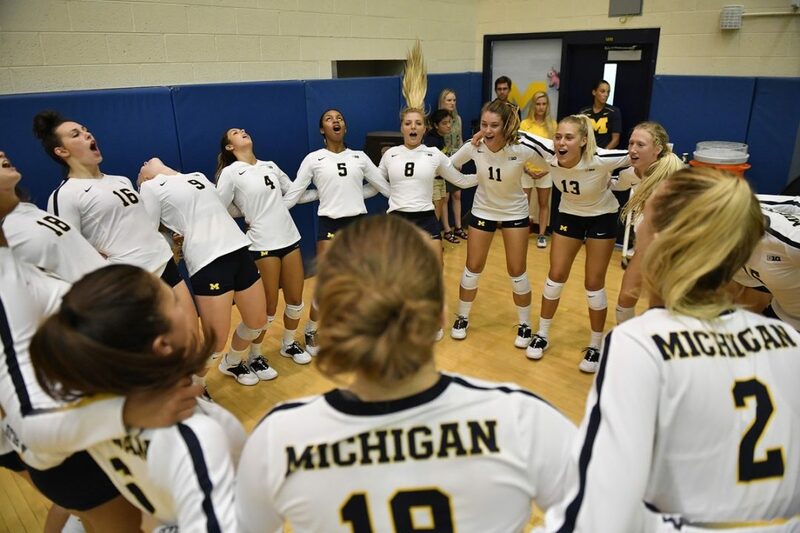 Michigan swept its first home tournament of the season last weekend with 3-0 wins over Cleveland State, Eastern Michigan and Harvard. Senior outside hitter Carly Skjodt (MVP), redshirt junior Cori Crocker, and senior libero Jenna Lerg were all named to the All-Tournament team for their efforts. Michigan’s senior class has posted a 44-10 record at home since the trio stepped foot on campus in the fall of 2015, and will look to maintain an edge at home once again this year. Based on the AVCA Preseason Poll, Michigan already set to host seven matches against top-25 competition this season. The 2018 season marks the Wolverines’ 46th season of volleyball. Michigan has an all-time Division I record of 747-654-5 and has totaled 17 NCAA appearances since the program’s inception in 1973, including six berths to the NCAA “Sweet 16,” an Elite Eight run in 2009, and a trip to the Final Four in 2012. The 2018 volleyball campaign marks the program’s 46th season and 20th under head coach Mark Rosen. In his time leading the Maize and Blue, Rosen has compiled a 390-244 record and guided Michigan to 16 of its 17 NCAA postseason appearances. In addition to serving as the longest-tenured volleyball coach at Michigan, Rosen is the winningest coach in program history.